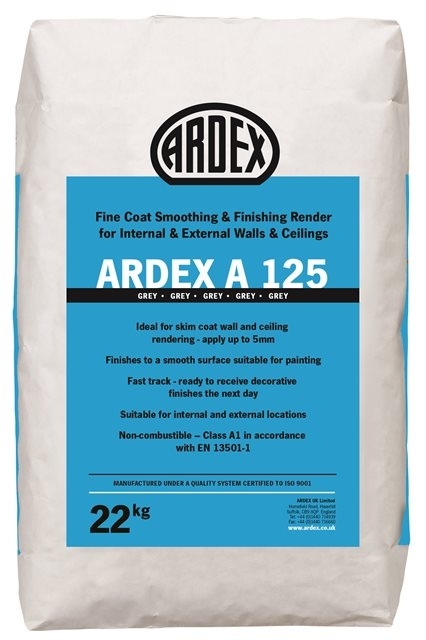 ARDEX A125 is a grey, cement-based, fine coat finishing render for walls and ceilings. It is mixed with water to produce an easily worked, slump-free mortar which dries to a hard wearing, water and weather resistant finish, with a smooth, dense surface suitable for painting. Ideal for skim coat wall and ceiling rendering - apply up to 5 mm. Finishes to a smooth surface suitable for painting. Fast track - ready to receive decorative finishes the next day. Extended pot life of four hours. Provides a hard wearing surface. Suitable for internal and external locations. Non-combustible – Class A1 in accordance with EN 13501-1. Used for levelling and smoothing over surface irregularities on wall and ceiling backgrounds such as concrete, brickwork, blockwork and previously applied cement/ sand renders prior to applying paints and other cement-resistant decorative coatings. It is suitable for internal and external use and is an ideal solution for areas subject to moisture such as swimming pool halls and underground tunnels. Low strength backgrounds such as lime/ sand renders are not suitable surfaces to apply ARDEX A125. Bulk density of powder: 1.6 kg/L. Weight of fresh mortar: 1.8 kg/L. Initial set (Vicat): Four hours. Final set (Vicat): 12 hours. Compressive strength: After 28 days, approximately 14.5 N/mm². Tensile bending strength: After 28 days, approximately 6 N/mm².